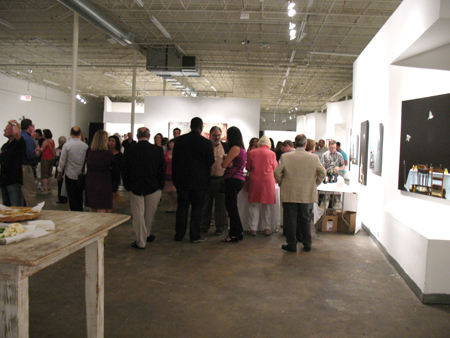 “A Web of Artists: Friends of a Social Network” is the official title for one of the three openings that I went to last night at Thomas Deans Fine Art in Atlanta. 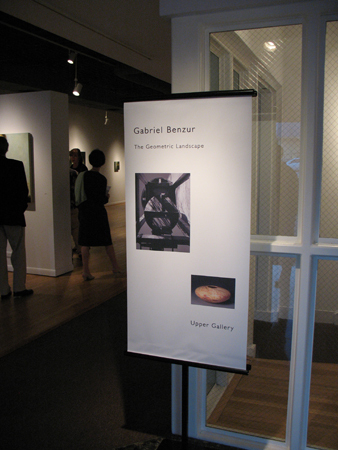 Previously on Bennett Street, the gallery has moved to Miami Circle. 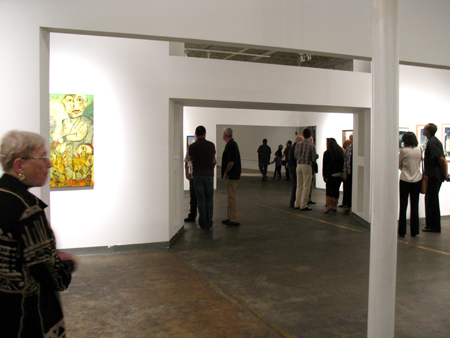 It’s an intimate space and the gallery did a great job of hanging the artists’ work. 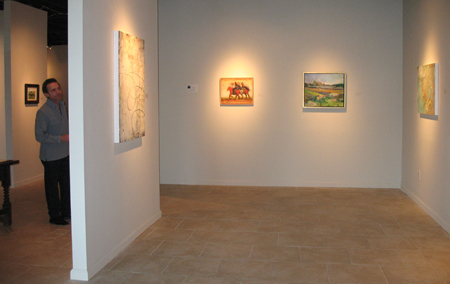 Not all artists in the show are represented here, you’ll just have to visit the gallery. 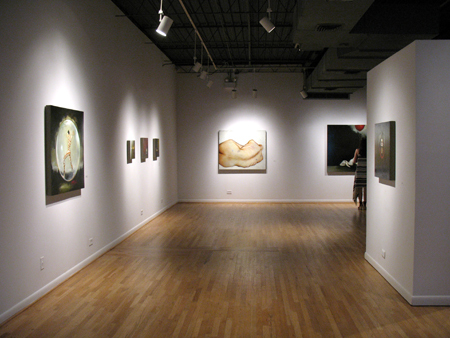 The show is up until October 13th. 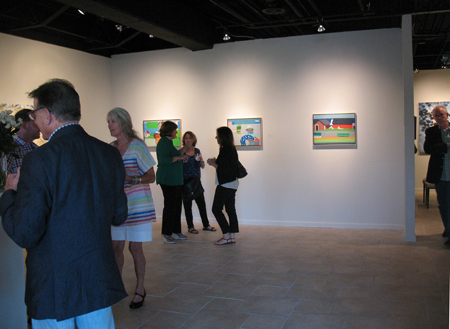 Surprisingly, I knew four of the artists myself; Ken Kewley, Philip Koch, Paul Behnke and Harry Shooshinoff. Some I know from Facebook, others post in various blogs that I follow. It was interesting to find a gallery culling from online for an exhibit and whose work the director may have never seen in person beforehand. Many of the artists are connected by residencies or teaching, or because they’ve found each other through social networks like Facebook. I met Ken Kewley on Facebook and we share a history of living in Easton, PA. 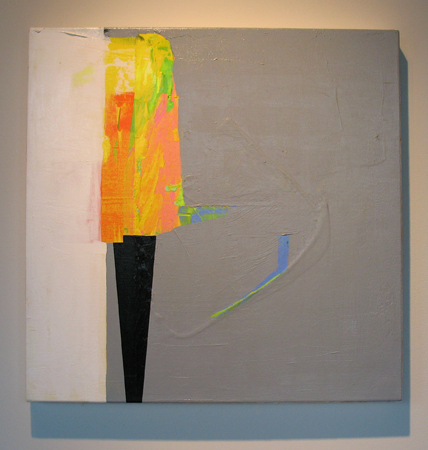 I first discovered his work through the 2010 notes he wrote about color on the blog Painting Perceptions. And I especially like that he uses a lot of greens, a color that one gallery director once advised me to change in my own work. He teaches art at PAFA, has taught at the Jerusalem Studio School Certosa program in Siena, Italy, and gives summer workshops in Michigan. I really enjoy his posts on FB about Braque and other artists. 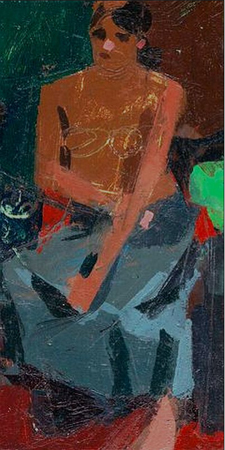 His three small figurative works of women in dressing rooms were just lovely. My camera isn’t so great in low light, so I’m including some work from Deans’ catalog and the artists’ websites as substitutes. Ken Kewley. 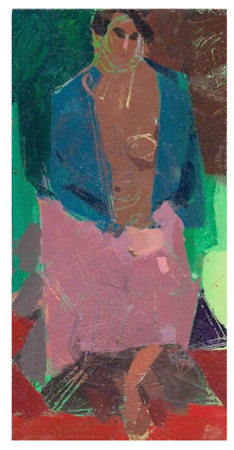 The Pink Skirt, oil on board, 10 x 5 inches, 2012. Ken Kewley. The Light Gray Wrap, oil on board, 10 x 5 inches. Ken Kewley. The Gray Skirt, oil on board, 10 x 5 inches. 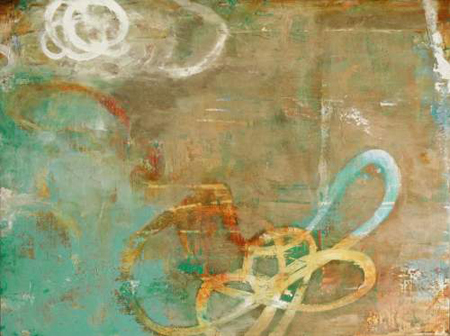 Several of these artists show quite often, like the abstract colorist Paul Behnke, who is featured this month in Richard Rosenfeld’s august gallery in Philadelphia with a catalog write-up by critic and The Brooklyn Rail editor John Yau. I discovered Behnke from Brett Baker’s Painters’ Table blog and have been following his Structure and Imagery for a while. I’m impressed with how many exhibits he writes about and appreciate his bold sense of color. He lives in Brooklyn. Paul Behnke. Little Je-Je, acrylic on canvas, 24 x 24 inches. Paul Behnke. 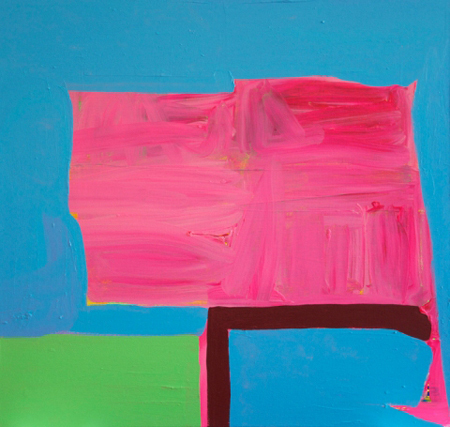 Vandervoort Place, acrylic on canvas 36 x 38 inches, 2012. Paul Behnke. 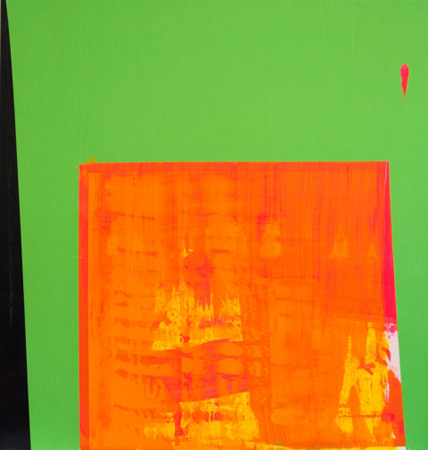 Orange Rampart, acrylic on canvas 48 x 46 inches, 2011. Philip Koch, another painter whose blog and Facebook posts interest me, has exhibited widely and is greatly influenced by Edward Hopper. 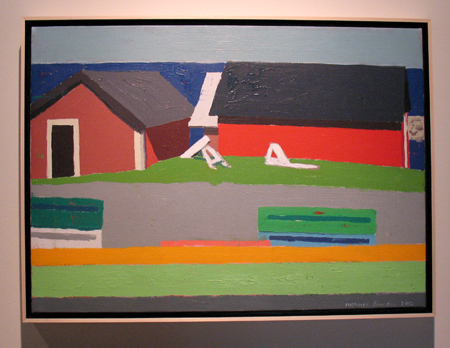 In fact, he’s painted in Hopper’s studio during the 14 residencies he’s spent in the S. Truro, MA residence. 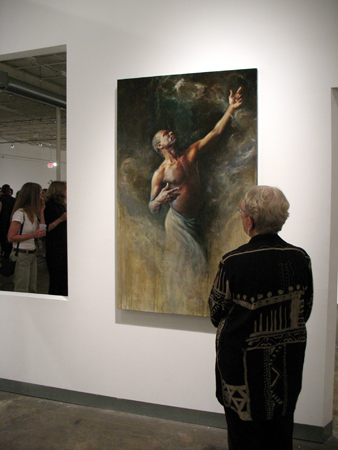 He paints from direct observation and memory, rather than from photographs. Koch is also one of the few painters I know, who acknowledges the Canadian Group of Seven, specifically Lawren Harris, as influences. Philip Koch. Deep Forest Pool, oil on panel, 30 x 40 inches. Philip Koch. 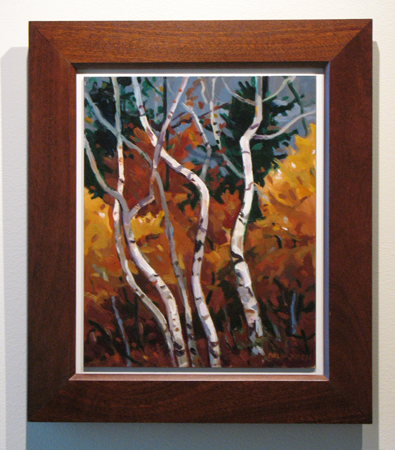 The Birches of Maine, oil on panel, 15 x 20 inches. 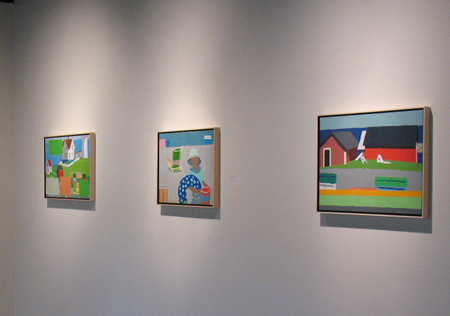 Harry Shooshinoff is an amazingly prolific painter whose work I first discovered online. 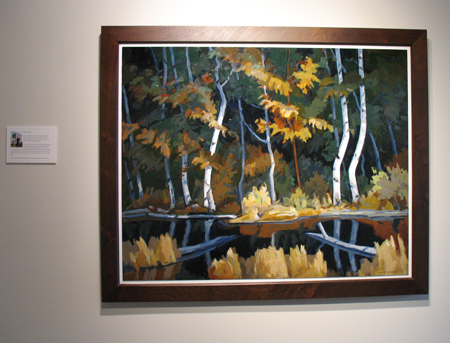 He lives a couple of hours north of Toronto in Ontario and paints the landscape that surrounds him. 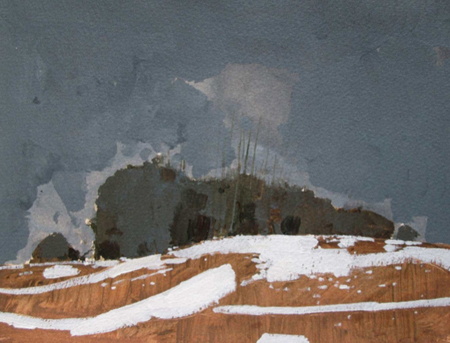 I love his small collages and paintings of snow covered fields and icy lakes that remind me of Nova Scotia, where I lived in the early 1970’s. Harry Stooshinoff. 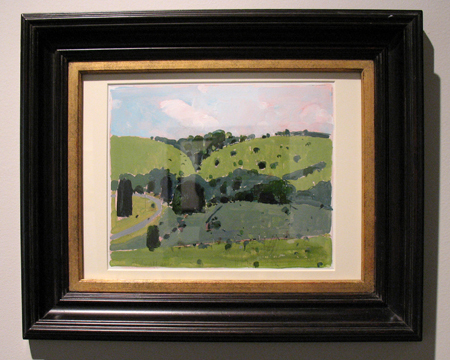 Early August Green (Toward Tommy’s), acrylic on paper, 7.5 x 9 inches. Harry Stooshinoff. Hedgerow (Overcast), acrylic on paper, 7.5 x 9.75 inches. Harry Stooshinoff. Edge, torn acrylic collage on Arches paper, 7.75 x 6.25 inches. 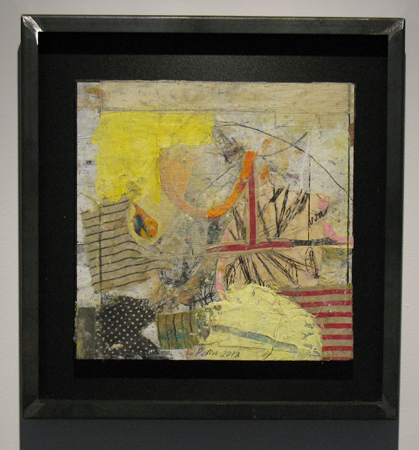 This was not in the show, I took it from one of his online sites to show his collage work. Donald Beal, whose work reminds me of the Bay Area Figurative movement from the 1940s to the 1960s, teaches art at Dartmouth and talks about struggling with the figure in this video. Interestingly, he notes that although he’s competent enough to paint an anatomically correct hand, it didn’t work in an abstracted figurative piece – so he changed it. 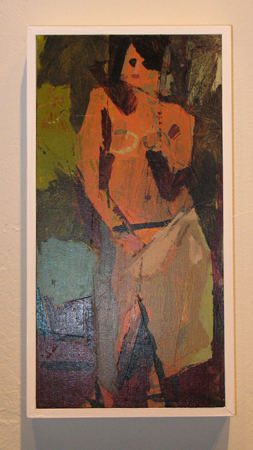 Like Behnke, who says he has no preconceived idea about color or form when he begins a painting, Beal discusses using tension and form to create a figurative work. Donald Beal: Portrait of an Artist; Carol Pugliese producer from Provincetown Community TV on Vimeo. Donald Beal. 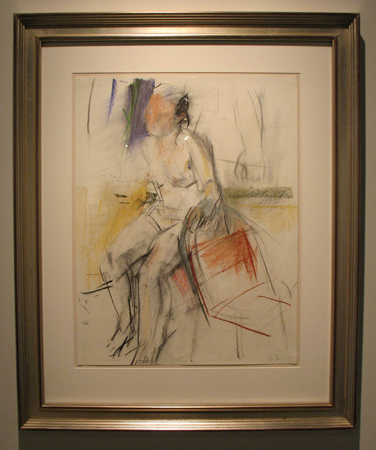 Seated Woman, charcoal and pastel, 23 x 18 inches. Donald Beal. Inlet, oil on canvas, 20 x 24 inches. Bill Gingles. Birth of Venus, acrylic on canvas, 24 x 32 inches, 2011. 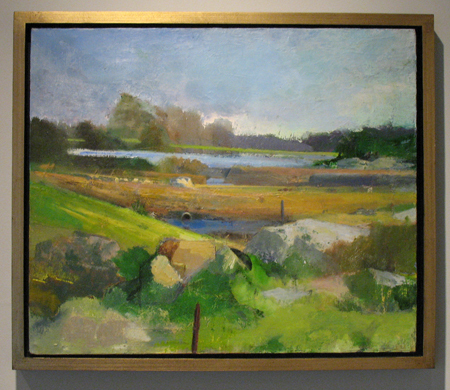 Mitchell Johnson, South Carolina born and living now in Redwood City, CA, has had his paintings featured in many films. 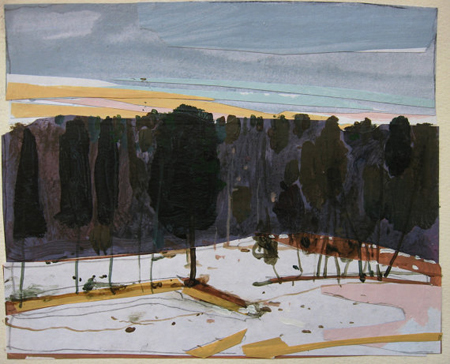 He first traveled to the Swedish island Gotland in 1989, and returned in 2008 to paint. Mitchell Johnson. Gotland, oil on linen, 18 x 25 inches. 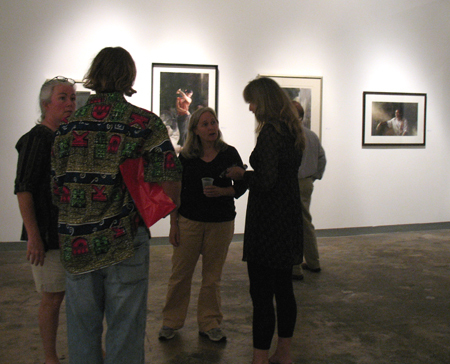 The next opening was up on E. Paces Ferry at the Alan Avery Art Company, showcasing two artists; Michele Mikesell and Gabriel Benzur. 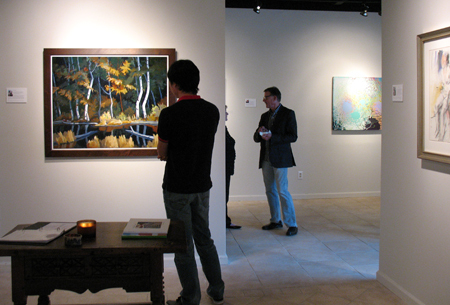 I was impressed with the posh spread, the gallery is in the heart of Buckhead and seems to be doing well. I spotted Jerry Cullum noshing. Trying to back out of the small lot afterwards, and not sideswipe the red Ferrari parked a tad too close to my pickup was one of my main concerns. Sorry that I missed the August exhibit with Caio Fonseca. 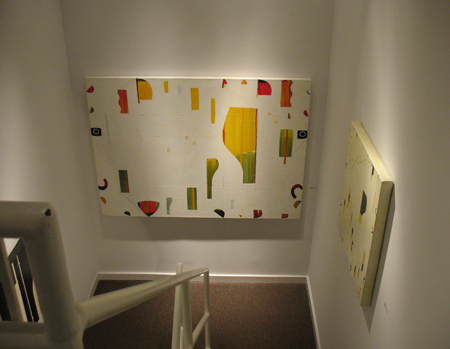 The gallery showed abstract painter and collagist Sammy Peters‘ exuberant mixed media works in the front room. Sammy Peters. Enigmatic: determinal; form, oil and mixed media on canvas, 30 x 40 inches. Sammy Peters. Deferred: precise; solicitation, oil and mixed media on canvas, 12 x 12 inches. Finally, I went over to Mason Murer Fine Art, where two old artist pals have been showing for years, Marc Chatov and Sidney Guberman. Figurative artist Suzy Schultz was one of the group featured last night, she has a studio around the corner over here in Avondale Estates, and offers watercolor workshops there. I had never been to the gallery before and at 24,000 square feet, it reminded me of the Phillips de Pury auction house in Chelsea, a gigantic arts warehouse. Overwhelming on first visit. The gallery had a Purvis Young piece I covet. Purvis Young. 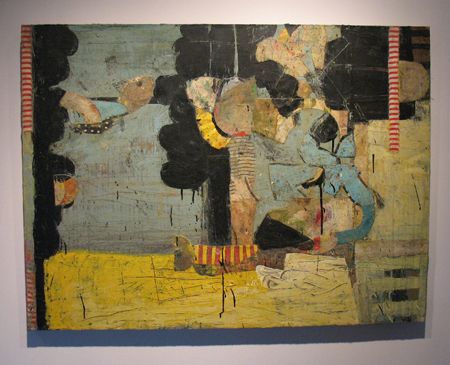 Untitled, mixed media on wood, 56 x 96 inches. Coming up in early October is the Westobou festival if you find yourself in Augusta. 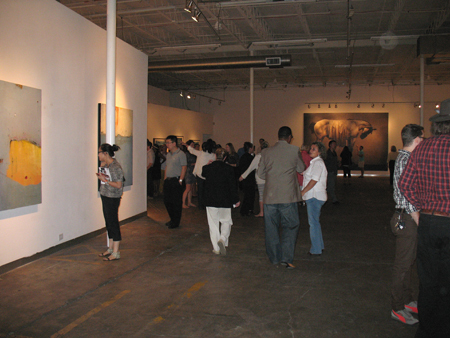 Many performances and events like the visual arts project are free to the public. 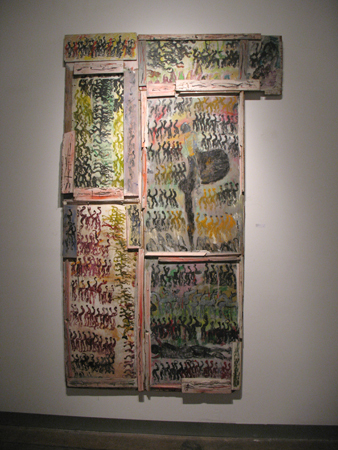 This entry was posted in Art reviews, criticism and blogs, Daily meanderings and tagged Alan Avery, Bill Gingles, donald beal, Harry Shooshinoff, Ken Kewley, Mason Murer, mitchell johnson, Paul Behnke, Philip Koch, Purvis Young, Sammy Peters, Suzy Schultz, Thomas Deans. Bookmark the permalink. Thanks very much for your post on our show at Thomas Deans. Wish I could have been there but your post makes it seem as if I was. BTW- I also love Sammy Peters’ work and was glad to see it here. Wow, I never knew Atlanta was such a happening art place. Oops, sorry Mitchell. I enjoyed seeing your work! Dean, thanks – Atlanta is booming right now in the arts. It’s very exciting after being away for 14 years. So many great artists all over the country! Thanks for the tour. Another exhausting weekend of Atlanta’s to-much-to-do. Why are so many Bennettians becoming Miamians?